ileal conduit use of a segment of the ileum for the diversion of urinary flow from the ureters. The segment is resected from the intestine with nerves and blood supply intact. 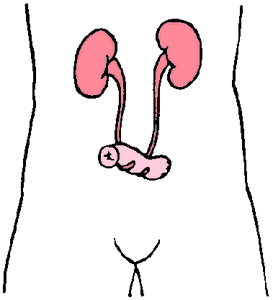 The proximal end of the segment is closed, forming a pouch, and the ends of the ureters are sutured to it. The distal end is brought to the outside of the abdominal wall and effaced to form a stoma. The remaining ends of the small intestine are anastomosed to reestablish bowel continuity, the ileal loop no longer being a part of the intestinal tract. Called also urinary ileostomy, ileal loop, and Bricker procedure. Indications for an ileal conduit include surgical removal of the bladder for severe trauma or malignancy, congenital defect of the urinary tract, and neurogenic nonfunctioning bladder in which other devices to maintain urinary flow are unsatisfactory. Prior to surgery, the placement of the stoma is determined by a thorough examination of the abdomen while the patient assumes various body positions. The site is selected so that old scar tissue, skin folds, bony prominences, and the umbilicus are avoided, thus providing a smooth surface for attachment of a drainage bag. Individuals wearing braces for ambulation must have the stoma placed so that there is no pressure on it from the appliance. Patient Care. Physical care of the patient with urinary diversion via an ileal conduit and collection of the urine outside the body is essentially the same as for any patient with a stoma. The following information is specific to problems of urinary diversion. However, persons with a stoma of any kind share many of the same problems, especially those related to the psychosocial impact of this kind of surgery. These common problems are discussed under stoma. Major concerns related to the physical care of a patient with an ileal conduit are peristomal skin care, monitoring urinary flow, control of odor, and selection and care of the collection device. Protection of the skin around the stoma requires attention to cleanliness and providing a protective barrier to prevent contact between the skin and the urine. Because there is continuous drainage of urine down the ureters from the kidney, there is always the threat of damage to the integrity of the skin from continued exposure to the caustic urine. It is not so much the flow of urine across the skin that is a cause for concern as it is the pooling of stagnant urine on the skin. Additionally, moisture has a tendency to collect under the faceplate of the collection appliance, thus providing an ideal environment for yeast and mold infections. To avoid this the area is cleaned periodically with soap and water and thoroughly dried. A protective barrier of some type (there are several alternatives) is then applied. Topical medications such as Mycolog ointment, Kenalog spray, or Mycostatin powder may be used to prevent or treat infections. The appliance usually must be emptied several times a day, depending on fluid intake and whether a leg bag is used to collect the urine. At the time urine is emptied its amount and characteristics are noted in much the same way one observes urine that has collected in the bladder and been voided normally. The major causes of odor problems in urinary diversion are improper techniques in cleaning and storing appliances, inadequate use of deodorant acidifiers, urinary tract infections, a poor quality collection pouch that allows leakage, and poor basic hygiene. Dietary factors also must be considered as possible causes; for example, asparagus causes a peculiar odor in the urine. The pouches used for collection of urine usually are cleaned with soap and water and rinsed in a white vinegar solution to help eliminate odor. Manufacturers of collection devices offer detailed instructions for the proper cleaning and storing of reusable appliances. Ileal conduit. From Polaski and Tatro, 1996. (il'ē-ăl), Do not confuse this word with ilial. Of or pertaining to the ileum. /il·e·al/ (il´e-ahl) pertaining to the ileum. see inherited alimentary tract segmental atresia. use of a segment of the ileum for the diversion of urinary flow from the ureters. a cause of chronic or intermittent colic of horses characterized by loud ileocecal gut sounds and a palpably enlarged terminal ileum on rectal examination. See also intussusception.